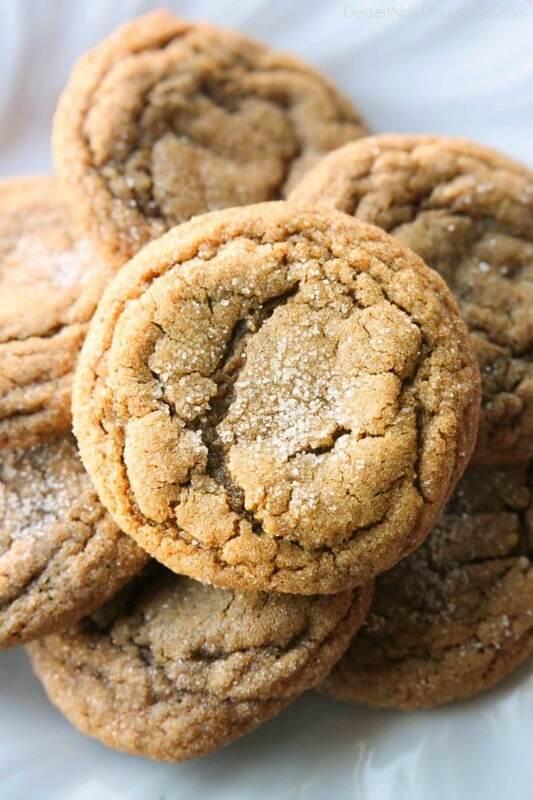 Soft Baked Gingersnap Cookies (+ Video) - Dessert Now, Dinner Later! Christmas cookies are my favorite thing to share for neighbor gifts. I’m not very good at the homemade Christmas candy thing, but cookies — I can do! There are some cookies that you only make around Christmas time. Mostly because they have that distinct holiday flavor, but that doesn’t mean you cherish those cookies any less. 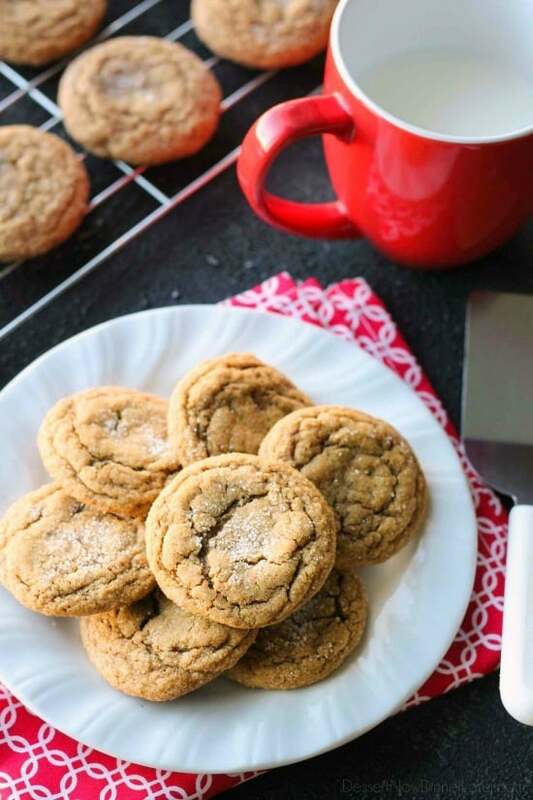 These soft baked gingersnap cookies are sure to fill your holiday with wonderful flavors and memories. That’s what makes Christmas special to me — traditions, memories, flavors, food. 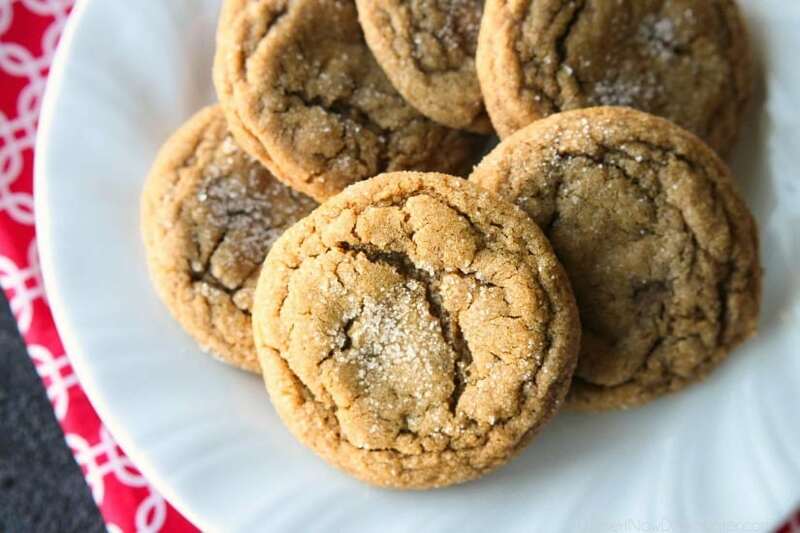 These soft baked gingersnap cookies are sure to make your tastebuds happy with warm molasses, rich spices, and a soft, chewy texture. 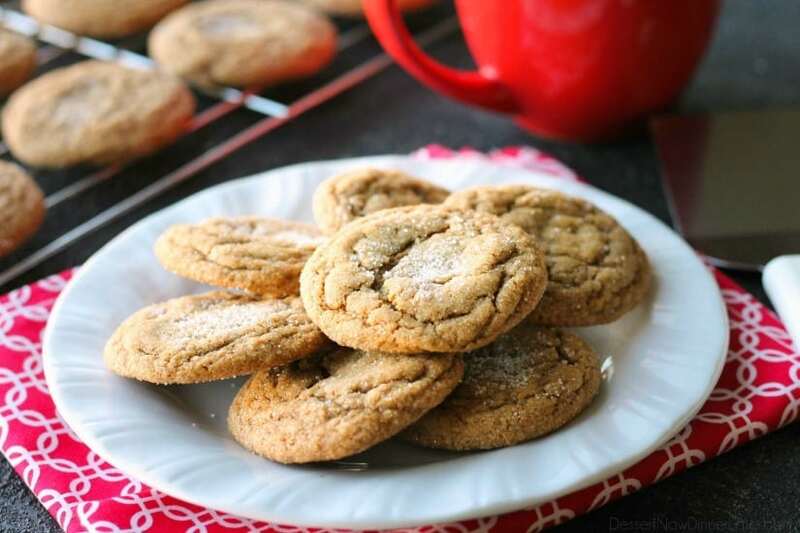 Traditional gingersnap cookies are crisp, so they “snap” when you bite into them. (They make a really great crust for my Pumpkin Cheesecake.) 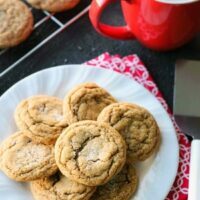 I actually prefer soft and chewy cookies, but I love the flavor of gingersnaps, so I combined the two into these soft baked gingersnap cookies. 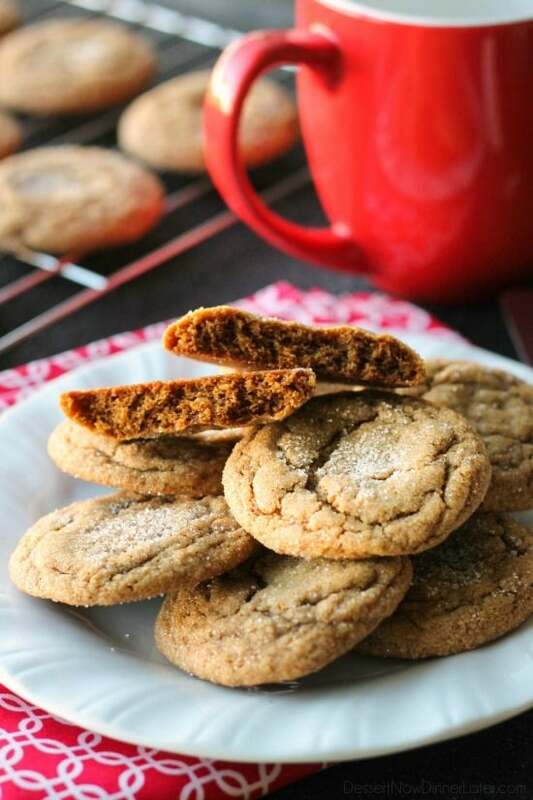 You’ll have to give these soft baked gingersnap cookies a try, especially if you love spice cake and other similar desserts with strong spices. 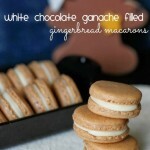 They are a wonderful holiday cookie! 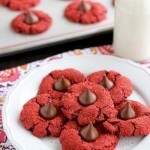 *SPICES: Feel free to taste the dough and adjust the spices before baking the cookies. Depending on how old/fresh your spices are, or based on personal taste, you may want to increase the measurements. Thanks Teresa! I hope you like them! I bet you could, but can’t say for sure because I haven’t tried it. If you do, will you come back and let us know how it worked out? Thanks! I made these and froze them into balls and to be honest the batch that was frozen was just as moist as the fresh ones. If I use salted butter, do I just omit the 1/4 tsp salt? It depends on your preference. Either way is fine. They are amazingly yummy. This is my new go to recipe for ginger/molasses. I would however, like to know if anyone has frozen them. I have a party in 7 days and it says they will only stay fresh 5. Any thoughts? I haven’t frozen them yet, so I can’t say for sure. 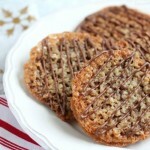 I would layer them on a tray with parchment paper in between and double or triple wrap the tray with plastic wrap. Taste is amazing!! Love them! However I’m dissapointed with the look. They did not flatten but stayed too round. I will smoosh them before I bake them next time. Hi Gabby! Thanks for the feedback. You can also try skipping the refrigeration to see if that helps them spread more. Glad they tasted good though! does this recipe work with cooking molasses? accidentally picked up cooking instead of fancy but hoping theyll still turn out! Cooking molasses will make it slightly less sweet, and will give it a more robust molasses flavor. You’ll have to let me know how it tastes. I don’t think it will effect the structure of the cookie though. 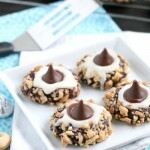 Do you think these would work as a cookie bar? They look so yummy! Hi.what makes these cookies soft? Well, like most cookies it depends on the ratios of sugar, butter, and bake time. This recipe results in soft cookies. Mine were FLAT 🙁 I doubled the recipe, but followed exactly – even baking them longer, shorter, they ended up either super crispy and flat or flat and gooey! Hi Stacey! I’m so sorry your cookies flattened. I have definitely had conflicting comments from they don’t flatten at all or they flatten too much. I’m thinking altitude really effects this recipe. Even for me. You can see in the photos that mine are thicker, but if you watch my video they are a bit flatter. I’ve moved since I originally made these for the pictures vs making the video and I am currently at a higher altitude, so I’m thinking these cookies are especially sensitive to that. Here is some info if you think altitude may be a factor for you, to maybe help you if you want to try again: https://www.kingarthurflour.com/learn/high-altitude-baking.html#cookies I’m so sorry they didn’t work out! Is it neceto roll them in sugar? Would it affect the taste much if I didnt? Also, anyone tried it with coconut or almond flour? You don’t have to roll them in sugar if you don’t want to. Substituting coconut flour is super tricky to do, I would avoid that altogether. Almond flour might work, but you may need an extra egg or egg yolk to bind it together. You might also need to press them down before baking. Not sure if they will spread by themselves with almond flour or not.